Have you ever dreamed of getting married in NYC’s Central Park? Central Park has long been a romantic destination for couples coming get married in New York City from all over the world. Rain or shine, Central Park is one of New York City’s most popular places to have a wedding ceremony. The opportunity for amazing wedding photos is endless. With hundreds of scenic acres, historic buildings, ornate bridges, and impressive gardens, it serves as a beautiful backdrop for love. Are you thinking about getting married in Central Park? Start here and allow NY 1 Minute to arrange everything with an all-inclusive elopement or wedding package. Meet Francesco and Ana, a beautiful couple from Italy and Brazil respectively who came to NYC to pursue acting. With impeccable taste and a desire for beautiful photos, they chose an all-inclusive wedding package for their perfect day in Central Park. Despite the rain, the skilled NYC photographers with NY 1 minute were able to capture the absolute romance and love that this couple showed each other. Our favorite moment of the day is when Francesco placed his umbrella over a puddle so his beautiful bride did not have to get wet! A true gentleman. NY 1 Minute was honored to help plan their dream wedding of getting married in NYC’s Central Park. The celebration took place on the bow bridge with an NY 1 Minute wedding officiant providing an intimate and personal wedding ceremony. They took pictures at the Bethesda Terrace and created amazing romance posing at the fountains that grace Central Park. They were a beautiful and stylish bride and groom and NYC 1 Minute provided elegant wedding flowers to add gorgeous color to the day. After the ceremony, they had a celebration at the historic Boathouse, one of NYC’s most romantic and popular restaurants for couples. 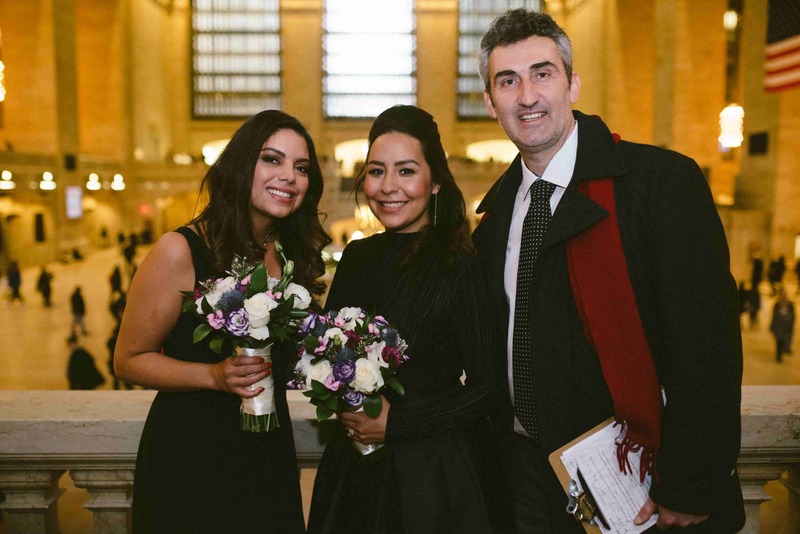 NY 1 Minute is happy to provide couples like Francesco and Ana a simple and easy way to realize their dreaming of a NYC wedding. With an all-inclusive wedding and elopement package, you can choose any location in NYC. NY 1 Minute will make sure that everything is taken care of and your wedding photographs are romantic and beautiful no matter what the weather is that day. Start your wedding planning today by booking an all-inclusive wedding and elopement package and realize your dream of getting married in NYC. Hello! Keith and I met you yesterday outside of the City Clerks office in Manhattan. We wanted to reach out to you and see if the afternoon of March 25 is available. We discussed the ceremony at the Bow Bridge in Central Park with pictures there and on the Brooklyn Bridge/Dumbo area. It was so nice to meet you at the City Hall. Getting married in NYC is fantastic! We will make the perfect wedding for you in Central Park on March 25th. We can absolutely do the ceremony at the Bow Bridge and do the wedding photography in Dumbo with the Brooklyn Bridge and the Manhattan Skyline in the background. We can also arrange the limo that you are looking for. We are excited to make this happen for and looking forward to celebrating your wedding in NYC!